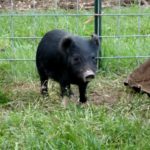 We recently added 5 piglets to the farm, so we’re starting a short series of posts on how to raise piglets! Read on for the first installment. 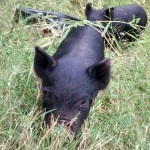 We had 3 pigs born in September which will be harvest size this fall at 1 year old. We wanted more pigs, though. 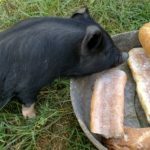 One reason was that we are given spoiled produce and bread to feed our pigs, and we were getting more food than our pigs needed. We enjoy that this food doesn’t go to waste, and that our pigs convert it into delicious pork. So more food meant more pigs. 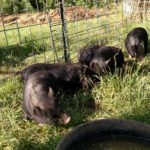 Another reason we wanted more pigs was to fill the void the older pigs would leave when they are processed in the fall. 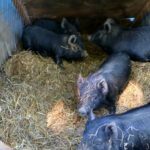 Pigs are part of our program here, and they provide jobs such as tilling up the earth. If we had no pigs, we’d have to do those jobs ourselves, meaning more work for us. By getting piglets now, we ensure they’ll be big enough to do the job when the older pigs are no longer here. Piglets are so simple in terms of care: food and water mainly. Shelter’s good, too. A fence to keep them where you want them. That’s it! They don’t need supplements, trimming, shots, etc. They just need food, water, a place to get out of the sun and rain, and a pen. As I mentioned above, we feed them spoiled produce and bread, plus our own kitchen scraps. 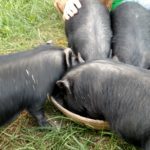 On the rare occasion we run out of spoiled food, they get pig grain. Piglets are so little, they can use a rubber pan for water. On hot days we check it a couple times per day since its holding capacity is low. This is the MOST IMPORTANT aspect when it comes to piglets. These adorable little piglets will soon be BIG and STRONG. You need to train them NOW when they’re small. Our main strategy for socializing pigs is that we go into the pen and pet them every time we feed them. At first, they’ll run away when we start petting them. After just a few days, they’ll stay there happily munching away while we give them pats and talk to them. Soon they’re running to the fence when we walk up! One quick note on this: don’t try to feed pigs from your hand in an attempt to make them friendly. They have bad eyesight and strong jaws, so that’s asking for trouble. Read all the posts in our piglets series!